Social media is all about getting social. (Hence, the name.) It’s not simply another outlet for you to force feed your company’s propaganda to your audience(s). But it is a way to gain exposure, market share and business. 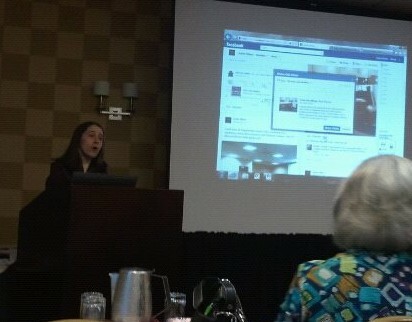 Yours truly imploring attendees to harness the power of Facebook for their businesses. Clearly Conveyed Communications is ready to help you navigate the always evolving, real-time social media world to achieve your specific objectives. We’re looking forward to working with you! Please contact us today for a free consultation to discuss how we can put our social media knowledge and experience to work for you. Check out our blog posts on social media for some tips to help you shine!